The frequency response of human hearing falls between about 20Hz to 20kHz and your ability to recognize different frequencies in this range is a crucial music production skill. As a producer or audio engineer you need to know not only which frequency you hear, you also want to be able to decide which changes to apply to frequencies to get the intended results you want in your mix. Good EQ skills, as you probably know by now, take a while to develop. The reason is because your ears and nervous system need many varied EQ experiences to learn to recognize frequencies. Audio frequency ear training allows you to fast-track the learning process. 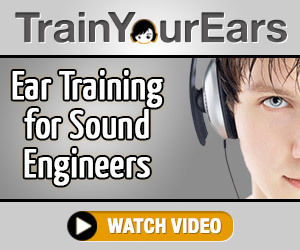 Below, you'll find my review of a program called TrainYourEars which, as you can imagine, is designed to help producers, artists and engineers like me and you train our ears. In short, I recommend this program to producers, artists and engineers at any level as it does what it says on the box. It trains your ears. It's also fun to use. Players - You'll find 3 types of players - Music, Noise, Live. Exercise Designer - This feature allows you to select, duplicate or modify preset training exercises or create new ones from scratch. Training - The Training view is where you do the actual training quizzes. The installation, which was on Windows 7 in my case, was quick-and-easy. I started with the most basic exercise. The program applies a random band filter and either cuts or boosts a frequency. I had to guess which frequency in the signal was adjusted and whether a cut or a boost was applied to the frequency. I was, not to brag, pretty impressed with my score for this basic ability even though I did get 3 wrong. Not bad. So, I was still decent at guessing band-pass filter positions and correcting opposing shelving filters. The narrow vs. wide Q factors exercise however had me stumped. It became quite apparent that I could do with some more training in this area. Ego-hurt pushed aside, I kept at the exercise. I decided, after a few more bad guesses, to really listen and think about it before I guess. This improved my results. I noticed an even greater improvement after 5 days of training 10 minutes a day. You'll find many more presets included and you can also design your own exercises. So, there's more than enough to keep one busy for a while! - Player controls on the training screen would be a great tweak in my opinion. + Excellent training designed specifically with engineers, artists and producers in mind. + Instant A/B - Doesn't sweep between frequencies, so no confusing your ears with sweep changes. + It's also a great way to notice how long it takes for ear fatigue to kick in because your results start to get worse. The program is easy to use. Modules and features are self-explanatory and intuitive as long as you have an understanding of basic EQ concepts. The exercises are superb as you get to improve a variety of your bread-and-butter engineering abilities as you fine-tune your ears and nervous system. The ability to create your own exercises or tweak existing exercises means you will increase the difficulty of the training once you're good with the preset exercises. This software is fit-for-purpose and definitely worth more than it sells for when you consider the crucial skills you develop with the training. I recommend it for any engineer, producer or artist who wants to speed up their music production progress. I like doing 10 minutes at least twice a week now and find it great to calibrate a mental reference point before I start any mix job.